When beginning a daily meditation practice, you may find yourself wondering how to meditate properly. When your’e unfamiliar with the procedures for quieting your mind, it can be difficult at first to stick with the practice. Consider going to a studio and taking a course on how to properly meditate. 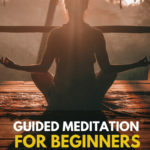 If you are finding individual meditation difficult as a beginner, you may want to consider finding a free guided meditation to help you learn the process involved in this important daily practice. What Is the Circle of Influence? Can Guided Meditation Change Your Core Values? Guided meditation helps beginners to learn how to meditate by employing the services of a narrator. The narrator, or guide, leads you through the process of relaxing both your mind and body until you are in a very deep meditative state. In most cases, this is far more profound than what even experienced individuals can achieve on their own. Once you have reached this state, your guide will lead you on a mental journey in order to help you achieve specific changes or personal goals. Our brain cannot tell the difference between an event that actually happened and one that has been imagined. This means that guided meditation is an excellent way to achieve real changes in your old thought patterns and habits because your brain interprets these meditative journeys as real. It is a way of reprogramming your mind, so to speak, in order to make change easier for you to achieve in your life. Your guide will help you with this using positive affirmations, and increasing your persistence. As we stated above, the brain cannot differentiate between a mental journey and a real, physical event. When you experience an important event in your life, your brain creates new neural pathways and stores information learned during the event in your subconscious mind for future recall and use. This stored information affects your behavior and patterns of thinking without you even being aware of it. Guided meditation takes advantage of the fact that your brain cannot differentiate between real and imagined scenarios. Your guide will lead you on a powerful mental journey that will help to change your behavior and patterns of thinking in positive ways. In the beginning, your guided meditation may focus on things like how to stay positive. This may involve having you learn and unconsciously repeat positive affirmations to yourself each day, or it may be an involved mental journey that imbues with the ability to stick with things and never give up. By making this your first lesson learned during guided meditation, it may make it far easier for you to stick with the practice and change your life in other ways. This is why many people choose these lessons as their first guided meditation practices. This may sound very difficult to believe at first. Although you feel skeptical right now, you may find this attitude changing as you continue to learn about guided meditation and how the process works. Recent psychological studies have proven that professional athletes who have been injured can continue to show improvement in their sport by simply imagine practicing the sport in their minds. As they imagine various scenarios, the muscles in their body actually activate in the same ways that they would if the athlete was actually standing on the field. This has enormous implications for what we can achieve using this valuable practice. Guided meditation is intended to help you improve not just physically, but mentally by helping you forge new neural pathways and modes of thinking to be more positive and productive. Positive affirmation can work, when they’re used in the correct way. Many people have tried using affirmations incorrectly and come to the conclusion that they don’t work. This is because at first, you’re often skeptical of the affirmation as you’re repeating it to yourself. Your way of thinking has not yet changed to support what the affirmation is telling you. Guided meditation can help change your way of thinking and having a low self esteem, allowing you to believe what you’re saying and accept the information more readily. Every person has a number of concerns that they must deal with in their daily lives. You may worry about the economy, the price of gas and groceries, things going on with friends and family, gaining or losing weight, changing habits, or becoming more successful. Your circle of influence contains only those concerns that you can you can actually change. Guided meditation takes advantage of the circle of influence, making it easier for you to determine which concerns actually lie within your influence. Many people spend the majority of their time focused on the worries and concerns that they have outside of their circle of influence. This pattern of thinking isn’t productive and doesn’t help you reach your goal. Guided meditation can help you change this habit so that you become more focused on the issues that you can influence and change. This can lead you to a number of positive outcomes, reaching your goals and achieving success in areas where you may not have had much success in the past. Our core values are the unspoken guidelines that define how we work, how we interact with other people, and the coping strategies that we use to cope with the situations we encounter in our everyday lives. In many cases, we may say and think that our core values are one thing, while our actions and interactions reveal that they are actually something different. While these examples are mostly positive, core values can be negative as well. You may believe in living frugally, but you may also have core values that lead you to become greedy or selfish. These core values affect every aspect of how you live your life. If your core beliefs are holding you back and preventing you from living the life that you want, guided meditation can help you with this. Changing your core values can be incredibly difficult. Guided meditation is an excellent way to help you change your core values more easily. For example, if your core values lead you to be a “Type A” personality who is known for controlling people, engaging in the proper meditation can help you change this tendency. This can lead more fruitful interactions with other people. Your core values when combined with your circle of influence are key components of your self-esteem and whether or not that self-esteem is high or low. If you have low self-esteem, participating in guided meditation sessions that focus on positive affirmations can help you to change this. There are times where our focus on issues that are outside of our circle of influence can lead us to have a victim mentality, we begin to blame our problems on all of these things that we cannot change, because we are not noticing or focusing on the things that we can. Guided meditation can help change this as well. Remember, guided meditation is more than just listening to someone repeat positive things to you. When you participate fully in a guided meditation session, you allow your guide to lead you on a deeply personal inner journey that has the potential to affect every aspect of your life. Although some deep-rooted negativity may take multiple meditations to change, guided meditation can make this process easier. When you participate in a guided meditation, change doesn’t feel forced as it often does when you attempt difficult changes on your own. Instead, change occurs naturally because you’ve had an experience that your brain perceives as real; the neural pathways in your brain have changed to accommodate these new experiences, and change occurs as a natural result of these changes. While not effortless, change is far easier when you use guided meditation as a catalyst for that change. IF you’ve been wondering how to meditate properly, or if you’re looking for a guide on guided meditation for beginners, we hope that this guide has helped. We offer a number of free guided meditation sessions here on our website that can help you learn these practices and help you begin to achieve the change that you seek in your life. Guided meditation can help you increase everything from your self-esteem to the amount of success that you are experiencing in your life and business. Guided meditation is an excellent way to help groups interact in a more cohesive manner, making it an excellent practice for use in many business ventures as well. Contrary to popular belief, guided meditation isn’t a method of controlling people; it is a way to open yourself to the possibility of change, rid yourself of a victim mentality, and change your inner core values to principals that fit more correctly with the life you want to be living.